The IP65 Garage Consumer Units from ESR are available in several different sizes with RCDs or Main Switches. This range includes the EGU616/MS, EGU616/63 and EGU632/63 models. ESR knows the importance of a reliable consumer unit and have delivered a high quality product with a range of features to make managing your unit a fast and simple process. From the quick release cover, to the IP65 water and dirt resistant casing, these consumer units from ESR are an outstanding unit at the centre of your home wiring solution. 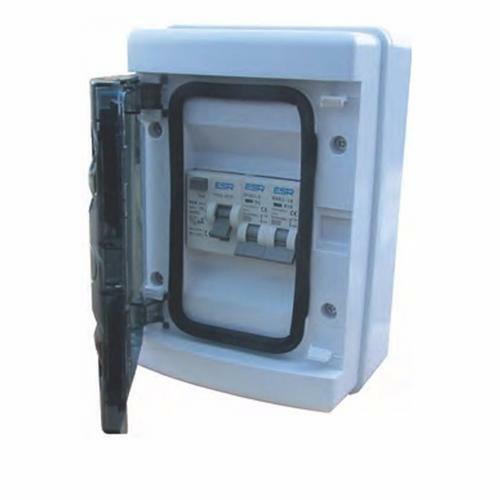 This unit comes pre-filled with modules suited to a small garage and its circuitry; with a 6A 6kA MCB, a 16A / 32A 6kA MCB, and a 63A 2 Module RCD or 100A mains switch, leaving only installation of the product to you or your qualified electrician. Featuring a dust & water resistant and flame-retardant ABS enclosure and well-securing cover these units will cut the risk of a fire hazard, and the units feature a clean, low profile, and stylish look for visible installations. How do i release the "quick release" cover?